Artist Jen Delyth creates original Celtic paintings and illustrations which explore the language of myth and symbol inspired by Celtic folklore and the spirit within nature. Her work is informed by the folk motifs and symbols of the ancient Celts, but woven through her experience and vision as a woman of the twenty-first century. 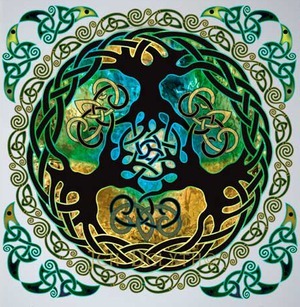 Jen Delyth created her distinctive and widely known image - "Celtic Tree of LIfe" in 1989, inspired by the interconnectedness of all things - the circle of life - plants, animals, the above and below, the circle that connects us all. There are no Celtic Tree images in antiquity, and Jen's "Tree of Life" was one of the first Celtic depictions to illustrate this essential philosophy - that although common to many cultures, lies at the heart of the Celtic religion and culture. The Ancients envisioned the entire cosmos in the form of a tree whose roots grow deep in the ground, branches reaching high into the heavens. Britain was once covered in extensive oak forest, and reverence for Trees is at the heart of Celtic spirituality. Druids had their teaching centers in the midst of Oak groves, and the words for wood and wisdom are similar (Welsh gwydd and gwyddon). The Celtic Druids, priestesses and healer-women encoded their deep knowledge of trees and herbs into an ancient cryptic Tree alphabet - an Ogham ciper — Beth Luis-Nuin. The ‘Tree of Life’ is an esoteric philosophy common to many cultures and mythologies. Also known as the World Tree, the primal Mother Tree was regarded as all-nourishing, all-giving, involved in the creation of the universe and the origin of the first man and woman. In the border motif the pot represents this Source, or Earth Womb, also symbolized as the Grail, or Cauldron of Regeneration in Celtic mythology. The interlacing branches symbolize the Celtic belief in the Continuity of Life. Yggdrasil is the World Tree of Norse Mythology, the Giant Ash tree that links and connects all the known worlds, the earth below, and the heaven above. Also known as the “Tree of Knowledge”, the “Tree of the Universe” and the “Tree of Fate”, Yggdrasil is the axis, the center of the creation of the Universe. Three roots connect the World Tree to the three wells that flow beneath. The well of Mimir whose waters are the source of all wisdom, the Well of Fate - Urdarbrunnr, guarded by the Norns, the well of Hvergelmir - Roaring Kettlle, the source of many rivers that nourish life. The World Tree is a symbol common to many societies. Within Celtic tradition, the Great Oak tree is most revered, and the Druids are said to have worshipped amongst the ancient groves. The great forests of our world help create the oxygen we breath. They are vital to our planet’s diverse ecosystem. Trees are a profound symbol of the interconnection of all Life.